Subdural haemorrhage. 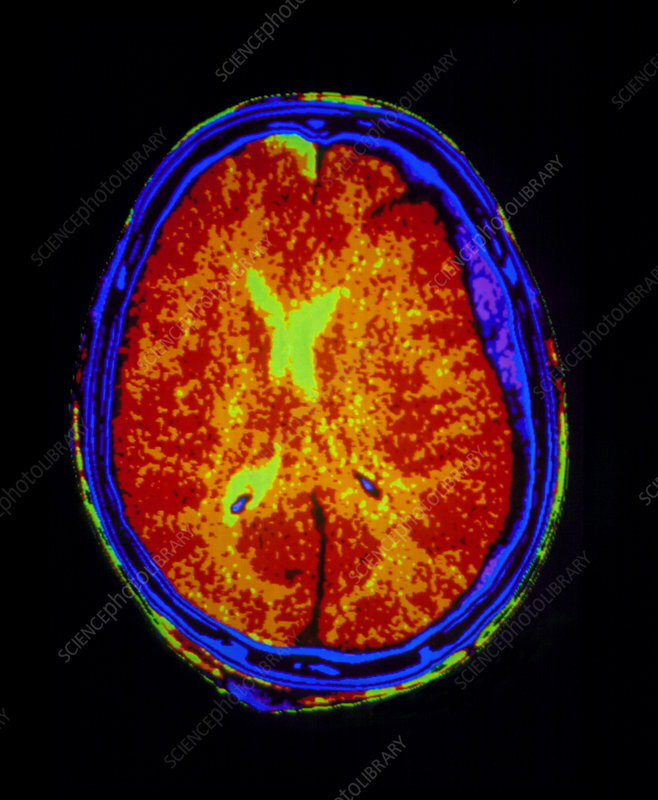 Coloured computed tomography (CT) scan showing a subdural haematoma (narrow, purple area at centre right), the result of a subdural haemorrhage. This is a bleeding that occurs into the space between the dura mater, the tough outer layer of the meninges, and the arachnoid, the middle meningeal layer. The trapped blood slowly forms an enlarging haematoma (blood clot) within the skull. The symptoms are caused by the pressure exerted by the haematoma on the brain tissue. They are headache, drowsiness and the paralysis of one side of the body. It is treated surgically by draining the blood clot and repairing the damaged blood vessels.